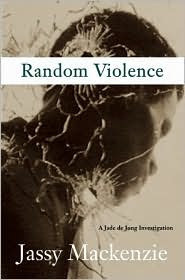 There's a lot of violence and several false leads in Jassy Mackenzie's first "Jade de Jong" investigation, Random Violence, recently published in the U.S. by Soho Press. Mackenzie also gives us a vivid portrait of post-apartheid Johannesburg, including suburban houses walled in against the violence, crumbling cityscapes, property speculation, some neighborhoods and townships flourishing while others descend into poverty, gangs, and neglect. The plot concerns Jade's return from self-imposed exile after 10 years working as a private investigator abroad. What brings her back is the release from prison of a man against whom she has sworn revenge, in connection with the murder of her policeman father. Her father's protege, David Patel, asks Jade for help with a difficult case (a murder/carjacking), not knowing that she will also be colluding with a petty gangster who has promised to help her with her revenge (and who has helped her with a previous revenge incident). The revenge plot carries forward into a plot twist while the murder gets more complicated (not random violence at all), and Jade's gender adds an interesting gender-twist to the noir tale, not only in the tough-girl as central character but also in the twist on the damsel-in-distress at the end. As she draws closer to an answer to the puzzle, David is suspended (when his boss discovers Jade's other agenda), the gangster-collaborator is sidelined, and Jade is left alone to face a killer that we have already seen graphically and gruesomely murder a couple of people. Given the extreme violence depicted (and also promised in the villain's musings as presented in the narrative), I found the conclusion a bit flat—not that I was hoping for more hyper-violence but given the villain's plans and prior actions, the denoument seems a bit quick and a bit contrived. Nevertheless, Random Violence is not only a detailed and involving portrait of a struggling, hopeful, and violent culture, but also a new take on the rapidly developing field of South African noir and a good read. Possible Spoilers if you haven't read the book. Be warned. I enjoyed this book very much. I have a different take on the denoument, though, I liked it. Jassy could have gone with the ultra-vi but her way showed that the villain, in the end, didn't really amount to much. I read RANDOM VIOLENCE and was put off enough by the violence to put the book away. But, I realized that the story was too interesting to ignore, so I went back to it, and enjoyed it. 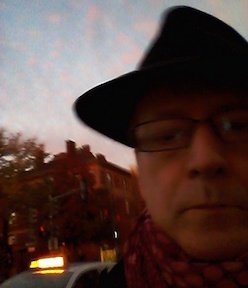 Jassy Mackenzie is not an American author. She is shaped by her country and her personal experiences and applies them to her heroine. Once I, as an American reader, got past the differences in perspective, I could appreciate the story. Mackenzie certainly knows how to create an villain. I read Anthony Altbeker's A Country at War with Itself, an analysis of the crime problem in SA, before I read Random Violence. It gave me more insight into where Jassy was coming from in her descriptions of violent crime, the use of boom gates to isolate residential areas, use of private armed security, etc. I wish another Jade de Jong was available now. Thanks, as ever, for a great review, Glenn, and I just love those paragraphs! (Thanks again for those). Despite what you write about the flat end, this one is going on my list based on your review. I find a lot of this translated fiction ends with a whimper rather than a bang, as if the author has got bored with the crime element along the way, and has become more interested, or distracted, by other side-issues. I hate those novels that have to end with some massive shoot-out or other OTT finale - so tedious. So for me, a flat ending is generally OK.